This is part of a series featuring excerpts from a journal I keep on my time in Sedona, AZ, especially up on Bryan’s Mountain (Bell Rock to the rest of the world). I put some of my youngest son Bryan’s ashes there under a tree in January 2007. In 2016, Emmanuel House—the living memorial started in his honor by his oldest brother Rick and his wife Desiree—was named one of the “Top 100 Most Innovative” social change organizations in the world. Emmanuel—”God with us”—was Bryan’s middle name. Grandson Liam at Bryan’s Tree. August 24. 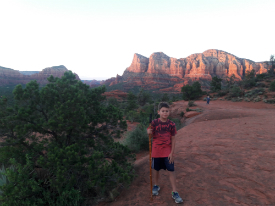 We’ve dreamed for years of beginning to bring the grand kids out to share a week in Sedona with us, and 9-year old Liam, the oldest, was the first. He and Linda arrived on the 17th. I’ve learned not to paint pretty pictures in my mind of the way things should go. You think kids—or anyone, really—will enjoy this hike, this restaurant, this song, etc., and they don’t, don’t, don’t. So I was hardly surprised when things didn’t seem right from the start. Not that Liam didn’t enjoy most everything we did and call this the best vacation he’s ever had, but he also coughed and sniffed and went in and out of fevers. We thought at first it was only him trying to adjust to this arid climate, which so many have problems doing, but this went on so long after we had gotten some nasal spray, nasal gel, cough drops, and more ibuprofen, that we finally spent about 3.5 hours at urgent care four days ago. They did a quick strep test just to make sure, and it came back negative. But today Linda, calling from New Jersey just before flying back here, said the clinic called her saying the back-up culture they did came back positive! The next day we saw Meteor Crater, and the next the Grand Canyon, and Liam seemed duly impressed, though he still coughed what I thought was a deep cough, and his voice got so scratchy he was reduced to whispering. “I kind of like it like that,” said Linda, who was met with a croaking, “Grandma, that’s rude!” But what he seemed really into the whole time was rocks. 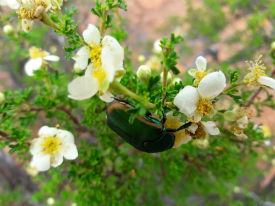 He looked for them everywhere, and we visited three of Sedona’s fanciest rock shops, marveling over their prices. A day before our urgent care trip, Liam perked up from a fever episode when we stopped at a less expensive one, the Village Rock Shop just a half-mile from our place. I’ve been thinking a lot about connections. Connecting to the first grandchild to visit, of course, but others, too. On the shuttle ride up from Phoenix Sky Harbor to Sedona a young woman described how she’d had a tarot card reading, then headed up to experience the supposedly powerful vortex energy of Bell Rock. As she started the main trail, a man suddenly appeared, pointing to a trail he said she should take so that she would arrive to find the exact kind of peace her tarot reader said she was after. “One of those Sedona stories,” she said. We just moved to Aurora a few months ago, so this year, sitting by Bryan’s tree, I’ve thought that it feels like my most solid home in the world, the geographical spot I most connect to. I loved our old house in Naperville, and the neighborhood, too, with my bank a block away, and a Trader Joe’s two blocks away, and friends in each place. I’m lucky to have lived in such a beautiful space—our Naperville mid-century modern designed by Don Tosi—and now another one, a historic “farm house” just a door down from another beautiful mid-century modern, next to which is an original Frank Lloyd Wright house. Still, I haven’t quite connected to the new neighborhood, and, because I’ll still be at North Central College another year-and-a-half, I’ll sneak in as many trips to my old bank and my old Trader Joe’s as I can. And I hope to finally take a picture of a house just about four blocks from our old house, and send it to the owner of the Village Rock Shop. This entry was posted in Family and tagged Bryan Emmanuel Guzman, Emmanuel House, Sedona. Bookmark the permalink.